Cape Cod kettle cooked chips launched in the 80s in a small storefront in Hyannis, MA. The chips soon became a local favorite. But outside of the region, they were swallowed up by a sea of Frito-Lay products. By 2011, category growth had stalled. 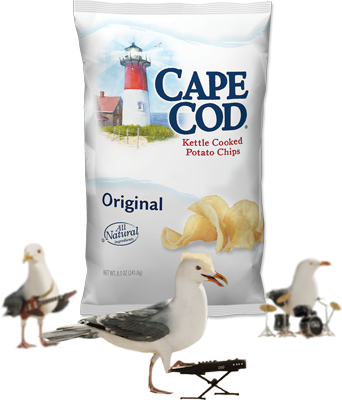 Cape Cod Chips needed to get noticed, and not just in New England. And they only had 10% of the budget of their larger competitors. Research indicated that the brand’s greatest strengths were its authentic Cape Cod roots and remarkably good taste. So we developed a campaign that brought the two together. The spot begins on a Cape Cod beach among a flock of seagulls. It ends in a far less expected place. Our regional roll-out results weren’t just good, they were ridiculously good. Proven ad recall quadrupled, and sales increased by 25%. The challenge for year two was even greater, go national with not a whole lot more money. Goodbye TV, hello 100% Digital (pre-roll, banners and social media) and hello to another year of 25% sales growth! GKV has experience with a wide array of packaged goods clients like Lance Sandwich Crackers, The Omega-3 Coalition, St. Joseph Aspirin and di•gel. Go to GKV.com to see our work. And if you like our Cape Cod story, you’ll love what we’re doing for Snyder’s of Hanover pretzels. We recently launched a new campaign where we invited consumers to “Discover the Pretzelbilities” of Snyder’s. Check out our ridiculously good Cape Cod campaign. Curious about what we could do with your Challenger Brand? Just email Dan Collins or Chuck Fischer, or call 410.539.5400 and ask to speak to one of us.